The acquisition of the RAAF's fifteen F-111G aircraft was without doubt one of the best value for money defence purchases of the last decade. These capable aircraft are aerodynamically superior to the RAAF's F/RF-111C fleet, with better climb performance, range and a more robust inlet design. While the purchase of these aircraft was by all means a sensible decision, budgetary constraints set by the former government meant that no additional expenditure was authorised to provide type specific support. It was expected that resources required to support the aircraft would be found elsewhere in the existing defence budget, including Air Force programs. The initial funds for purchasing the aircraft amounted to A$70M, and an additional A$74M was reallocated in the existing budget to provide logistical support. Per airframe this amounts to just under A$10M, which compares very favourably with the cca A$70M one would pay for a new fighter bomber, excluding logistical support costs. Reacting to these circumstances, the RAAF quietly conducted the customary study on the logistical supportability of the aircraft, while concurrently evaluating the type operationally to decide how best to integrate the aircraft into service with 82 Wing. An unusual aspect of the former government's directive to the ADF was that the aircraft was not to be subjected to a weapon system upgrade to improve supportability, as is being done to the F/RF-111C under the AUP program. The F-111G project was initially managed by the DoD's Department of the Secretary of Acquisition and Logistics, who retain responsibility for managing the DFCS upgrade, G-02 software upgrade, G-WSSF and provision of ATE (see below). In service logistical management responsibility was transferred to the RAAF's 501 Wing in late 1995. A number of upgrades for the F-111G are currently in the pipeline, scheduled for implementation, and a number of upgrades are under serious consideration. The intention is to provide a degree of commonality with the post AUP F/RF-111C aircraft to minimise support costs, and maximise operational availability. All F-111G aircraft will be fitted with the Digital Flight Control System (DFCS) used in the F/RF-111C AUP aircraft (see AA Aug/Sept 95). At this time, component kits have been acquired for all fifteen aircraft. The six aircraft currently on the flightline will be refitted first with a target IOC for the DFCS upgrade by 1998. Remaining aircraft will be refitted during scheduled deep maintenance work in the latter years of the decade. Concurrently, the RAAF is proceeding toward a domestic software support capability for the aircraft's mission computers. The RAAF intend to field the G.02 software (OFP) upgrade by the end of 1997, which will see the RAAF acquiring the source code for the computers. Because of the aircraft's SAC origins, this source code had to be purged of all modules which related to the aircraft's former SIOP mission and weapon types. The acquisition of source code will be paralleled by the provision of the G-WSSF software support and development environment. At this time it is unclear how much effort would be required to adapt the existing F/RF-111C AUP software maintenance environment to support the G-model. Because the G-model uses the AYK-18 mission computer, and has a number of avionic differences from the AUP system (no Pave Tack, different INS, no GPS, Doppler Nav), the software developed for the AUP cannot be used without a large number of modifications, and qualification testing. As well numerous hardware and software changes would be required to the AUP WSSF. The issue of software support is complicated by the fact that the AUP upgrade employs newer and more powerful AP-102A computers, which although using the same 1750A architecture binary code as the AYK-18, do differ sufficiently to make the software non-portable across the machines. The USAF had originally sought a progressive computer upgrade for the F-111A/E/G and upon the retirement of the F-111G, the F-111E/F. With the impending retirement of the USAF F-111 fleet, this upgrade was cancelled. The upgrade would have involved shrinking the two mission computer black boxes down to a pair of boards, shrinking an avionic interface box and stores management box down to a pair of boards and repackaging the whole set in to an existing black box chassis. This upgrade had progressed to the point of flight testing on an FB-111A airframe, using bare bones software, but was cancelled in early 1995 due the budgetary decision to retire the whole fleet. This decision also led the USAF to cancel a planned upgrade of the F-111F Pave Tack with a new Texas Instruments Focal Plane Array thermal imager, which would have significantly improved the reliability and picture quality of the Pave Tack. The RAAF is therefore faced with two options in this area, should they wish to maintain a substantially unique F-111G avionic suite. The first is to acquire boneyard spare (obsoleted) AYK-18s to provide for hardware support, and maintain highly specific software for the F-111G, with dedicated programmers and development systems. The second option, involving higher short term expenditure, but lower long term costs, is to refit the aircraft with the better AP-102A computer, common to the AUP aircraft. The latter alternative yields the benefit of shared computer hardware logistics between the G and C aircraft, and the ability to use a lot of common source code. The common components of source code would then be compiled with options either for the C or the G model, to accommodate avionic and aerodynamic differences between the aircraft. The RAAF is yet to decide which strategy to follow in this area, although it is fair to say that a refit with AP-102s is a technically and logistically much cleaner solution. It is intended that the G-WSSF, in whatever form it takes, be operational by 1999. An issue which is as yet unresolved is whether the AUP Stores Management System (SMS), common to the F-18 and F/RF-111C, will eventually be fitted to the F-111G. Should there be a requirement for the aircraft to support the full range of munitions carried by the F/RF-111C, then a good case can be made for a refit. If the aircraft are to be limited in munitions capability and thus roles, then the existing stores control hardware (ACU) would be operationally adequate, but difficult to maintain due effective obsolescence. While the option of back-fitting the F-111G with Harpoon computers extracted from the F/RF-111C during the AUP program does exist, it may be argued that the cost in doing so is of the same order as the fitting of the F-18/F-111C SMS, for much less benefit. The LN-39 electromechanical INS in F-111G predates the Honeywell RLG INS in the AUP aircraft and will become obsolete well before the latter does. Fitting the RLG to the F-111G will require a number of software changes and associated qualification testing. The Doppler Nav equipment is unique to the F-111G and will require dedicated logistics, although with a 5,000 hr MTBF it is not seen as problematic. The remainder of the aircraft's offensive avionic suite is common to the AUP aircraft, and will be supported by the same logistical system. The RAAF's strategy is to cannibalise non-flying F-111G aircraft for such components until the AUP logistical system becomes operational later in the decade. From that point in time, both types will share logistical support for common components. An issue which has arguably not been explored as extensively as it should be is the option of rebuilding the G-model aircraft to an almost full AUP avionic configuration. This involves primarily the tasks of fitting the AUP AP-102A computers, avionics fudge box (ACU), stores management computer/decoders (SMS/SED/ASED) and rewiring the aircraft with the new AUP wiring harnesses, replacing the existing wiring. Doing this removes almost all of the problems associated with maintaining separate avionics logistics and documentation, and importantly, allows the aircraft to be supported by the existing AUP WSSF software maintenance facility with minimal changes. Developing the WSSF was the single most expensive component of the AUP project, and it can be argued that a patchwork incremental upgrade of the G-model together with the costs of adapting the custom built WSSF to support a substantially unique G-model would incur similar costs to a full AUP rebuild. A conservative estimate AA has acquired is that adding the F-111G to the AUP program and cycling the aircraft through once the F/RF-111C has been done would cost between A$5-7M per airframe. This is because nearly all of the engineering work has already been done for the AUP. The engineering overheads in this approach would be similar to those incurred in the RF-111C AUP, in that the core avionic suite is identical, and a minimum of unique hardware and software would need to be used. The F-111G will retain the TF30-P-107 engines, while the F/RF-111C will be refitted with the TF30-P-109 engine in a recently approved upgrade. The 109 series engine, to be cannibalised from mothballed F-111D aircraft, shares many components with the 107 engine, and delivers slightly higher thrust. The option of fitting the 109 engine to all aircraft was rejected as too expensive, because the tailpipes in the two types are canted at slightly different angles. 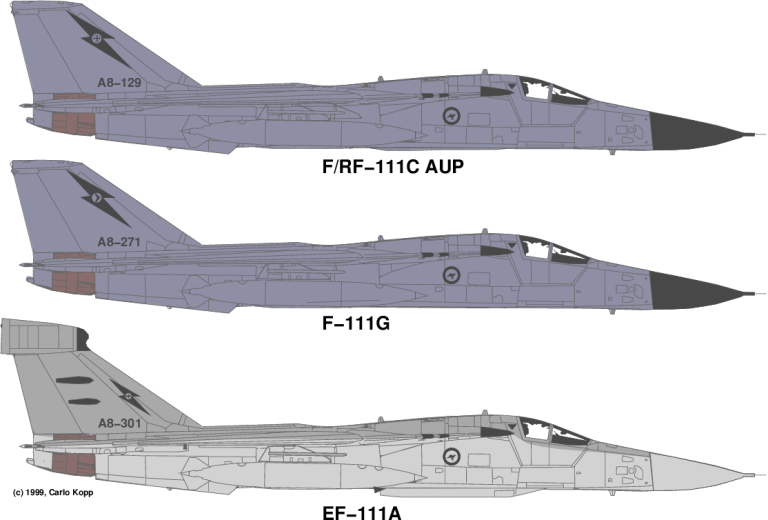 Fitting the 109 engines to the F-111G would require a hybrid installation, using the afterburner and tailpipe from the 107 and engine proper from the 109. Because this involves expensive qualification testing it is not currently under consideration. 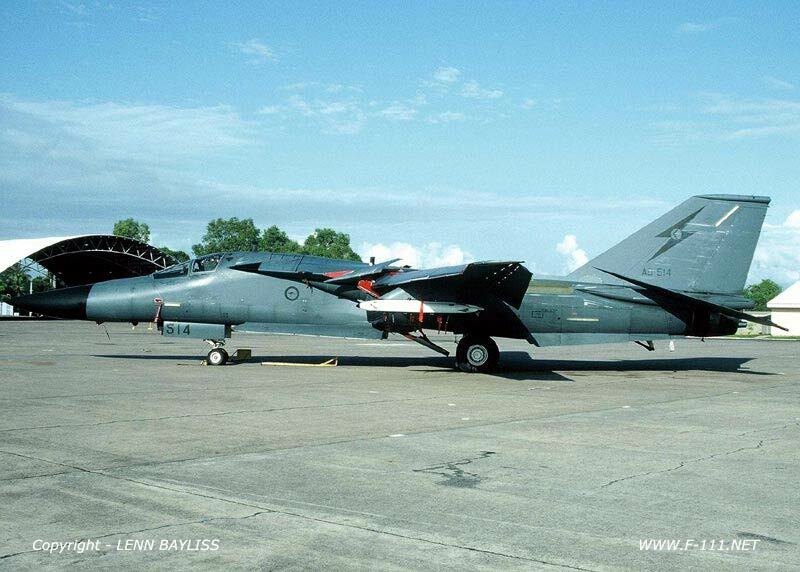 The RAAF is presented with an interesting dilemma in the F-111G aircraft, as a result of the previous government's unwillingness to provide resources for full long term logistical support of the aircraft. To derive the full operational benefit from the F-111G, and to minimise the type specific support costs, the RAAF will need to maximise the avionic systems commonality between these aircraft and the F/RF-111C AUP. To do this, the RAAF will need additional resources in the short term, to do the necessary engineering work and acquire the needed avionic components. A good case can be made for extending the F/RF-111C AUP program to include the F-111G aircraft, as this solves virtually all of the long term support problems associated with maintaining a substantially unique aircraft. The payoff in fully integrating the F-111G into the operational strike wing is that of almost doubling the number of the RAAF's multirole strike aircraft (ie 17 x F-111C, 15 x F-111G and 4 x RF-111C), for very little expense in comparison with acquiring new strike aircraft. The fifteen additional airframes would provide a substantial surge capability in wartime, and allow the airframe life of the existing fleet to be stretched more effectively by spreading the fatigue load over a much larger pool of airframes. Full integration of an F-111G using substantially common software and avionics would have the further benefit of minimising the amount of type specific aircrew and maintenance personnel training. We can hope that the new government follows through on its pre-election commitment to focus resources into the ADF's combat capability, and to support the F-111 force. The F-111 Wing is the sharp end of the ADF's offensive capability and it would serve Australia's interests well for it to receive the focus it deserves.